Source: Don Olsen 16mm collection. Louis Stein (onboard films) , Bill Burner (16mm camp life), Ken Hathaway (anamorphic), Jim Holmes, R.Reynolds, Al Rose, J. Bucholzer. 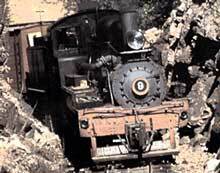 West Side Lumber Company still had 3 foot gauge railroad operations in the Sierra Nevada Mountains until 1960. These were steam locomotives at work… logging! After viewing one of Catenary’s truly excellent, SP Coast Daylight programs, I have sought out some other titles of theirs. Logging Lines are just plain cool. I do see the appeal of this subject material. Featuring steam engines on twisting, mountainous trackage, is sight to behold. As I have stated on the ‘ About Me’ page: You may even pickup a new interest. Logging Lines are my new favorite. Engineer Bert Bergstrom was employed at West Side with a career that began in 1916. He is our colorful, second narrator. Adding from his own personal experiences, Bert is a worthy addition. Old Bert really livens things up. He is humourous and knowledgable about history, running trains, the doings… back in those woods. Narrator Fred Krock gives us a clear delivery, with a sharp script. The show presentation plays very similar to a PBS style program. Sometimes, the narration will drop and we can listen to the natural train sounds, or some bluegrass style music. Well-balanced program. The show smartly provides a supply of maps to keep us ‘on track’ with the story. Overhead still photos are deftly included. This was done for the benefit of model railroaders. How cool is that? First line shown is Tuolumne City To Yosemite National Park border. A distance of 18 miles, if you were a bird, took 70 miles on the West Side! Mountain grades, some exceed 4%. That is a steep 4 foot gain for every 100 feet of track. Fascinating footage from onboard the train is combined with scenic views to really give the viewer a good feel of the terrain. There are multiple trains filmed here. Shays are shown pulling log cars in both color and black and white. A 1953 fired burned up 25,000 acres of prime timber. After viewing some of the fire, operations are shown within the scorched forest. Known as Deadwood afterwards, there is some lore. Further back in the forest, many camps are seen and visited. Bert has great stories throughout! Bad food, bridge building, camp squatters, bedbugs, plow trains, and daily life are some tales. There is a nice segment on plow trains. Bert’s storytelling breathes life into the great footage. Filmed in b&w, I wonder how the cameraman, climbed up there. This is before the line is cleared. Camp life is another feature. The film within the film. Loggers at work provides a unique view of the work in an early era. A 1941 scene shows the families and their belongings that are loaded on flat cars, ready to travel to the camps, in the spring. The Hetch , Hechy & Yosemite depot is the departure point. Wow! Derailment incidents are covered in detail. Another fine feature. Plenty of film, photos, history and accompanying stories. An illustrated discussion uses very simple map background provides the backdrop. Adding rudimentary locomotives and cars to the map, works like a charm! The viewer will understand the various train movements, and locomotive assignments after this sequence. Woods engines and companion town engines are discussed. Loads down/ empties up. Basic and brilliant explanation. Some pristine color footage follows on an extended downhill train segment. Action at the river, log cars are unloaded, segues into the mill area. A Heisler switches the yard. Standard gauge boxcars interchange via Sierra Railroad, to pickup the finished lumber. Bert has plenty to say about the vicinity. There is the Warren Haack additional, no narration bonus footage that runs for 20 minutes. Natural sounds and more West Side Lumber, color trainwatching! Outstanding in all areas, this is a fantastic program. A comprehensive show, this will give viewers a complete history of this West Side Lumber logging line. The whole family will enjoy this highly detailed and engaging story of this last narrow gauge, steam-powered, logging line. This entry was posted in ATVR Reviews, Catenary Video, Steam Train Reviews and tagged American Train Video Reviews, California, Logging, narrow gauge, PBS style, Train DVD by William J. Hudson. Bookmark the permalink.